This topic shows you what you need to start programming DirectX games for the Windows Store. For now, these templates only support Windows Store game apps. First you need Visual Studio, then you can install the DirectX game learning templates that are available for download. Download and install Microsoft Visual Studio 2013. Note The DirectX game learning templates work with Visual Studio 2013, including the Express edition for Windows Store apps. Visual Studio 2013 has tools for graphics programming, such as debugging tools. For an overview of DirectX graphics and gaming features and tools, see Visual Studio tools for DirectX game development. Download the DirectX game learning templates from the Code Gallery. The templates come as a Visual Studio add-on in a .vsix installer. Double click the .vsix file to install them. After the templates are installed, you can choose New Project from the File menu and select Installed->Visual C++->Windows Store and select the project of your choice. The new templates appear on the bottom of the list. The DirectX game learning templates are complete projects, so you can build and run the solution right away. 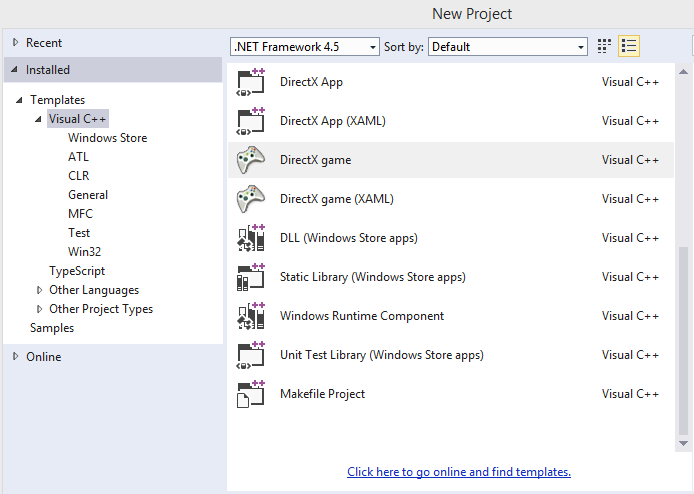 See Create a DirectX game project from a template in Visual Studio to get started. Learn about the templates for creating a Windows Store DirectX game. An overview of DirectX specific tools available in Visual Studio. Learn how to get and use the graphics diagnostics features including Graphics Debugging, Graphics Frame Analysis, and GPU Usage in Visual Studio. Learn more about the GDC 2013 game templates for a Windows Store DirectX game, see Create a DirectX game project from a template in Visual Studio. If you are porting an existing game, see the following topics. If you are creating a new DirectX game, see the following topics.